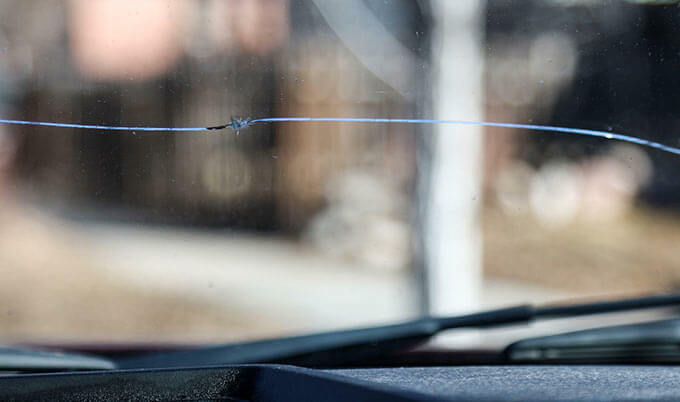 Are you currently driving with a crack in your windshield? You might think it is okay because you are still able to see, and it's not like you’re driving with bad brakes or anything, right? Well, the truth is, driving with a crack windshield can become potentially dangerous as driving with bad breaks. Now, some cracks are more severe than others however all cracks should not be left untreated. Here is why it pays to stop procrastinating and get that windshield on your Nissan Sentra fixed. Windshields are designed to keep the driver and passengers safe from the outside environment. So technically a little impairment to the glass doesn't pose an immediate danger. A car windshield is two layers of glass laminated together. These layers are intentional to provide a safety layer. However, the threat poses when the breaks are left untreated. When the integrity of the glass has been compromised, it can decrease the visibility of the driver as well as jeopardizes the safety of the passengers in the car. California Laws Regarding Cracked Windshields? Under California Vehicle Code 26710, it is illegal to drive a car if the crack in your windshield prevents you from clearly seeing the road. The California windshield law applies to both the front and rear windshields. Breaking this law is more severe than just a fix-it ticket. If you are pulled over by a police officer or a highway patrol for a cracked windshield, you have 48 hours to fix it. If you ignore this correction, then you can get arrested and will have to appear in front of a judge, after you get the windshield fixed. Taking this risk endangers you, your passengers, and those around you. If you are a seasoned car owner and have experienced a crack in the windshield before, then you know how a small break can quickly turn into a significant problem. Physical movements such as your car going over dips and bumps can enlarge the crack. The movement of the windshield wipers can also cause the break to grow. In some cases, harsh air pressure can turn a small crack into a shattered glass. I had a small untreated chip on my 2005 Tundra and during a scorching day (typical 102 degrees Southern California day), I got into my car, blasted the AC only to look up and see a massive crack across my windshield. It turns out it was a common issue on the 2005 Tundras. Once the integrity of the glass is gone, the quality decreases. The general rule is when you fix it while it is small then you can avoid potentially significant problems. There are several ways you can fix a small chip or crack. The size and the position will determine the best course of action. If your crack is less than 3 inches and it isn't near the driver's side, then chances are you are safe to fix the windshield. However, anything more prominent, and if the placement is near the driver, will require a complete replacement. Fixing a chipped or crack in your windshield is one of the easiest, and cost-efficient, DIY car repairs a car owner can do. You can purchase one through Amazon for about $15. The steps are straightforward. Once you receive the kit, the first thing you need to do is dig out any loose glass with the pin provided, and then thoroughly clean it, and the surrounding area. You will have to stick a small device to the windshield that forms a seal around the rock chip, and then a vacuum contraption will work to apply the resin into the crack. The complete repair will take less than an hour. If you aren’t keen on DIY projects, you have plenty of other options. You can go to those “fix it for free” companies that are at the mall. However, they go through your insurance company causing you to jump through some hoops and sign paperwork. The other thing you can do is Yelp mobile glass companies that come to you. This is convenient because they usually come to your work or home. Keep in mind these convenient mobile companies come with a hefty price. Doing your research and shopping around is well worth it if this is the route you want to take. The last option is to drive to a glass auto shop. Again, do your research to find the best deals and the most well-reviewed company to do the job. Remember it is illegal to drive with a crack windshield; it can also be hazardous. Minor movements and environmental changes can cause a cracked windshield to shatter. A cracked windshield diminishes the quality of the glass, jeopardizing you, your passengers, and those around you. It’s one of the unfortunate instances that car owners go through, but it cannot go untreated. So, be a reasonable car owner and get it fixed or replaced ASAP.